Schoolgirls can achieve lower blood pressure, stronger muscles, better balance and improved jumping performance if their school puts football training on the timetable – including girls who have never played football before. 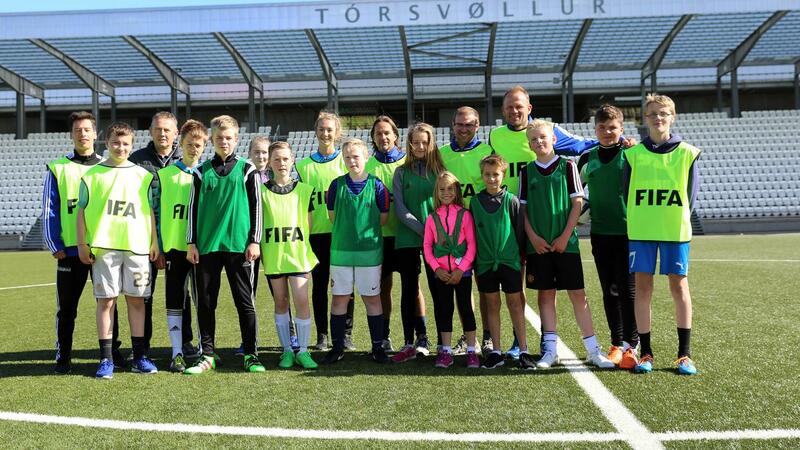 The children in the trial were girls and boys aged 10-12 at 12 Faroese municipal primary and lower-secondary schools. They were divided into an intervention group (292 participants from 9 schools) and a control group (100 participants from 3 schools). The study concludes that football training is suitable for improving physical fitness and strength in 10-12-year-old schoolchildren, and boosts early prevention of lifestyle diseases. The girls achieved improvements in systolic blood pressure (5 mmHg), mean blood pressure (2 mmHg), muscle mass (0.7 kg), horizontal jumping performance (13 cm) and balance (2.1 sec). The improvements were just as pronounced in the 84% of girls who did not normally play football in a football club. The study was implemented with funding from the Faroese Institute for Public Health, the Faroese Football Association, the Danish Football Association and FIFA's research unit F-MARC. FIFA 11 for Health is an 11-week programme of teaching health on the football pitch in which the children train, play and learn. The project was originally developed in 2009 for teaching in Africa, where football training was combined with messages about hygiene, HIV, malaria and clean water. The European version was created in a collaboration between Professor Peter Krustrup, the Danish Football Association and FIFA's research unit F-MARC. In the European version, there are two 45-minute lessons a week and the health messages are related in particular to physical activity, varied diet and social well-being. The focus is on small-sided games – football played as e.g. 3v3 on small pitches. Small-sided games are motivational and inclusive because all children are involved in the game and have a lot of touches on the ball. In small-sided games, the intensity is high, which has a positive impact on fitness, bone health and a number of other health parameters. At the same time, the children's social well-being is improved, partly through the use of Praise Partners, where the children are split into pairs and give each other positive feedback after the activities. See a video explaining the concept here.